Cranberry Chicken served on Top of Herongate’s Favourite Stuffing! The Herongate Barn Theatre is the perfect place to bring your family and friends for an afternoon or night out during the holiday season! The kitchen staff always serve a delicious, home-cooked meal that will far exceed your expectations. So fresh, perfectly cooked, and naturally flavourful. 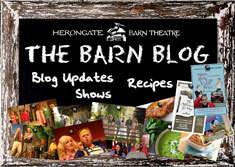 You can find some of Herongate’s favourite recipes right on their website! I want to make sure you know that you can bring the memorable flavour home with you! o 1 loaf of bread cut in cubes and lightly toasted or 8 cups ready made croutons. 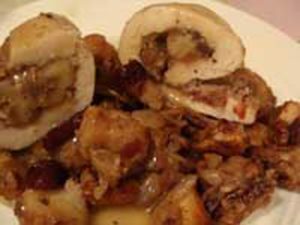 Place chicken pieces in a baking dish with 2 cups of chicken broth. Bake, covered in a pre-heated oven @ 350°, for 30 minutes. Then, remove chicken from the broth and let the excess liquid drain and discard. Cranberry, apples, raisins, curry powder and orange concentrate to make the final topping. combine this to the bread/ croutons with salt, poultry seasoning and walnuts. Place the stuffing into the bottom of your baking/serving pan and spread the chicken pieces evenly on top. Cover the chicken with the cranberry mixture evenly over all (this keeps the chicken moist in the last cooking period). Lastly, bake for 30 minutes @ 350°. This dish can sit and wait for service on the stove top for up to 10 minutes before serving! Comment on this blog post and let me know what you think about this recipe! Check out https://www.herongate.com/herongate-recipes/ for more of Herongate’s favourite recipes!